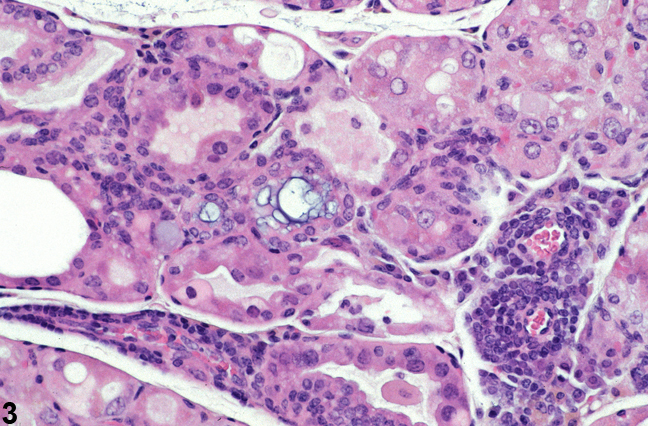 Thyroid Gland - Inflammation, chronic in a female Tg.AC (FVB/N) mouse from a subchronic study. 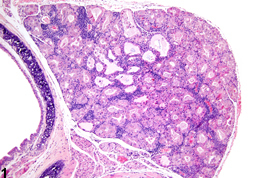 Small aggregates of lymphoid cells are present at multiple sites between follicles. Thyroid Gland - Inflammation, chronic in a female Tg.AC (FVB/N) mouse from a subchronic study. Higher magnification of the small aggregates of lymphoid cells in Figure 1. 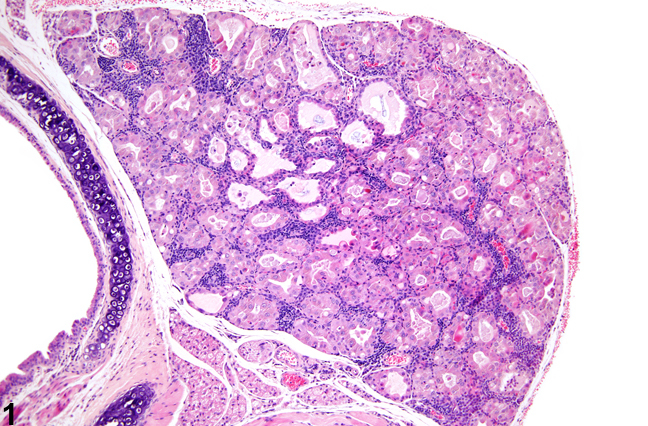 Thyroid Gland - Inflammation, chronic in a female Tg.AC (FVB/N) mouse from a subchronic study. A perivascular accumulation of lymphoid cells is present. Spontaneously occurring cellular infiltrates are rare in thyroid glands of mice and rats. Multiple changes are present in the thyroids of these treated mice ( Figure 1 , Figure 2 , and Figure 3 ). Lymphoid cell infiltrates are present between follicles ( Figure 1 and Figure 2 ) and in perivascular spaces ( Figure 3 ). 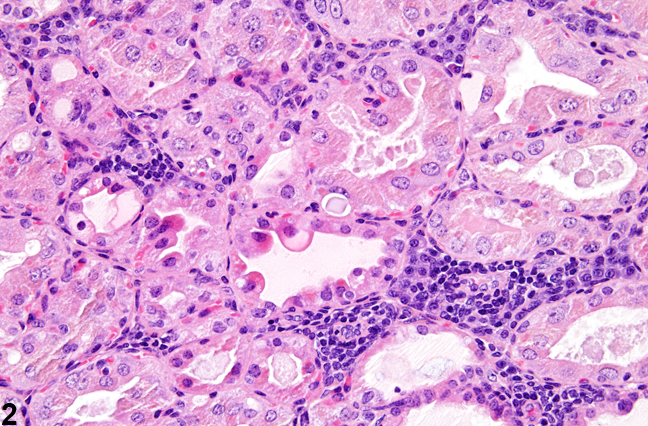 Additionally there is hypertrophy, degeneration, and necrosis of follicular epithelium. Inflammation of the thyroid gland should be diagnosed and given a severity grade whenever present. The type of inflammation should be indicated in the diagnosis with a modifier (e.g., thyroid gland - Inflammation, chronic). In the absence of other changes characteristic of inflammation (e.g., edema, necrosis, degeneration), a diagnosis of cellular infiltrate with the cell type identified (e.g., thyroid gland - infiltrate, lymphoid) may be preferred. Other changes (e.g., colloid depletion, follicular cell degeneration, necrosis) not be diagnosed separately unless warranted by their severity. These other changes can be described in the pathology narrative. The diagnosis should indicate whether the inflammation is bilateral, with the severity grade based on the more severely affected thyroid.